EU Institution and international players have launched a number of initiatives in order to mobilise financing of sustainable projects on a global scale. Channelling public and private funds is considered indispensable for reaching tangible results in the fight against climate change according to the Paris Agreement and the Sustainable Development Goals. At the EU level, a very ambitious Action Plan was launched in March 2018 leading to rapid acceleration of legislative and non-legislative initiatives. At international level, fast-moving developments have taken place under the roof of the Network (of Central Banks and Supervisors) for Greening the Financial Systems and UNEP FI (United Nations Environment Programme Finance Initiative). In spring 2019, just before EU elections, some of those developments will be reaching advanced stage: 1/ the Network for Greening the Financial System will release its first Report on climate risk on 17th April; 2/ Some milestones will have been reached on key elements of the legislative framework addressing investment services such as the regulation of disclosures and ESMA technical advice for integrating sustainability and risk factors in MIFIDs); 3/ UNEP FI Principle for Responsible Banking - of which EACB is a supporting Institutions- will be approaching finalisation, as the deadline for consultation with stakeholders is 31st May. Thus the event will be an occasion to tackle the momentum and discuss, at a crucial point in time, those relevant topics in an informal settings. - What are the supervisors’ expectations at this stage? - Which tools are on the frontline from a methodological and practical perspective (e.g. stress testing, data collection, modelling, IT implementation)? - Where do banks see the most significant impacts? The panel will discuss the impact on cooperative banks stemming from the legislative work being undertaken to fulfil the Commission’s action plan on the way in which cooperative banks presently organise their investment services practice (both internally and towards clients). The aim of the panel is to create an opportunity to learn from each other and get a deeper understanding of issues that may arise in implementation and ways to overcome them. Particular attention will go to the impact of the action plan on (i) Relationships: with other players in the investment services ecosystem, and with their clients, (ii) Legal uncertainty: resulting from the fact that a commonly agreed taxonomy not in place, possible inconsistencies with other legislation and other liability risks, (iii) Product range: if and how is it likely to change and (iv) the cost and performance aspect at bank level of the changes to be made. The panel will consist of a mix of EACB members and policy makers/influencers. The panel aims at having a dialogue and comparing approaches on sustainable and responsible banking. In the panel session UNEP FI will present the Principles for Responsible Banking that are under consultation until end of May, exploring the suitability for potential endorsers: what benefits? what challenges? what are the experiences so far? 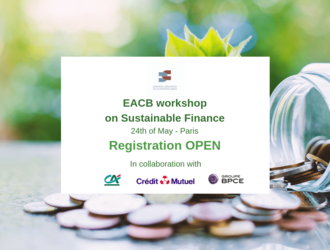 Representatives of co-operative banks will highlight their current approaches and provide answers to the UNEP FI Principles (non-compulsory) - bearing in mind the different sizes of banks and their customers in the EU. Discussions will also cover the common views of EACB Members, based on the EACB's reply to the UNEP FI’s consultation.